Win at SouthWind Casino, with THREE great locations in Oklahoma. The Kanza Casino (located inside the Kanza Travel Plaza at Braman, OK) is our newest facility and features more than 40 gaming machines for your entertainment. Plus, the Tower Grill, serving a variety of fast, casual dining selections. Our Braman Casino location is just south of the Kansas border on I-35 at Exit 231. Recently expanded, it offers nearly 300 gaming machines, plus Off Track Betting, and the contemporary 231 Bistro & Bar. And don’t forget about our original location in Newkirk, OK. Featuring hundreds of gaming machines, Bingo, and the KANZA Grill, its an entertainment destination. Good luck and gamble responsibly. 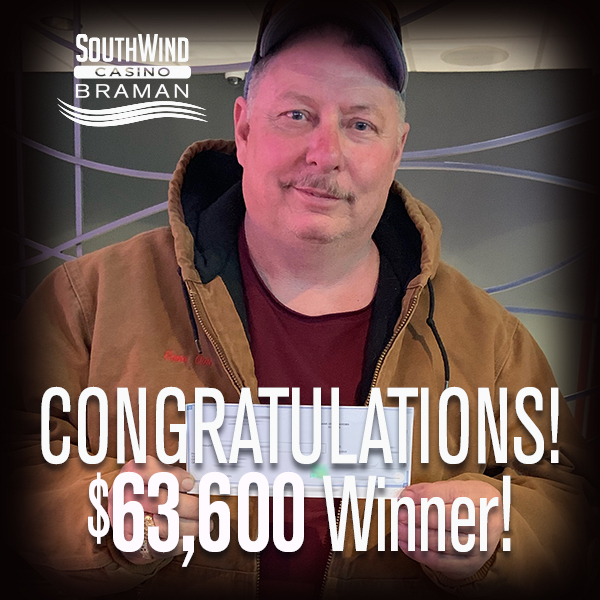 Congratulations Southwind Casino Braman guest Eugene on his big win of $63,600 playing VGT Red Hot Ruby on 2/20/19! Another reason why Southwind is the Luckiest Casino in Oklahoma.